Catching cuteness requires candid skills... LOL... Here, our bride just spontaneously reached up and gave her guy a peck on the cheek. You just have to be ready for those moments, no matter when they happen. To ask them to do it over is possible, but the moment is lost and it never looks the same. This girl was as bright and vivacious a bride as we've had in some time, just full of energy, life and love. Her guy was hard put to keep up with her all night long! 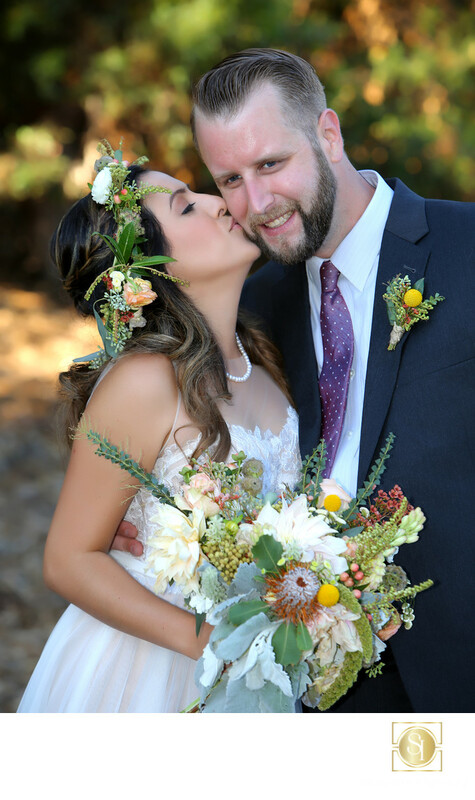 This was done after the ceremony during a break in the reception, outside in a forested area near the estate where it was held in Rancho Santa Fe. As those familiar with "The Rancho" know, there are huge groves of eucalyptus trees throughout the area. We were just down the street from The Inn at Rancho Santa Fe, just on the edge of the groves. The photo was shot with a Canon 5D mkIII and 70-200 f2.8L IS, one of the staple lenses for wedding photographers. A Canon 600 EX-RT provided a little key light and the image was complete!